Guess what we've been braving this week? I am not the least bit inclined to go on about potty training, but I sort of need to mention a mothering experience that led to this adventure. Back in December I had the distinct thought (impression?) 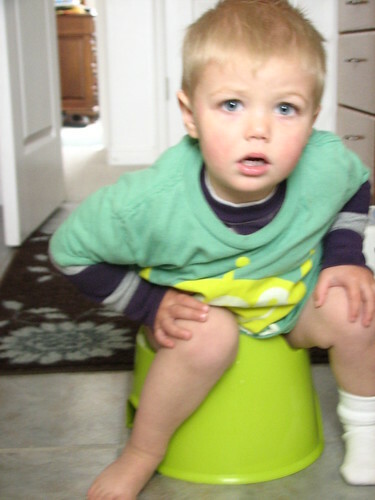 that we ought to get a little potty training seat for our Captain. 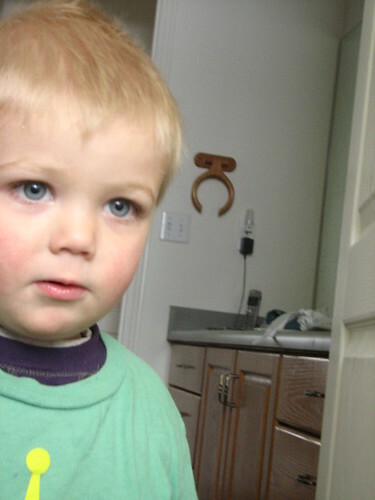 Sir O never used one, he took so long to have interest in potty training that we jumped right to the miniature toilet seat that fits over a regular toilet, and that was that. Mr Renn was quick to blow off my impression because the Captain is 2 full years younger than Sir O was when he began potty training in earnest, and so Christmas came and went. But the thought never went away. So last week when I finally happened to be in the land of Ikea, I decided it was important to finally act, and so I braved the store by myself with all 3 kids, just to get a potty. And every time the Captain has sat upon it, he has performed. And every time he performs, Sir O says "Conragglations!" In other words, it is going well. Funny how that happens with motherly impressions. I just need to buckle down and decide we're doing this in earnest and not just for fun. (And, you know, be house-bound for a month or two). Maybe there's hope for my diaper budget yet. Potty training. *sigh* We've tried all sorts of seats around our house, but I guess non of them are going to work until the kid decides he wants it bad enough. Even the Elmo Potty Time video failed to motivate him. Still, I will rejoice in your success. You've earned it! Hooray for you! I have myself a somewhat potty trained 3 year old. I keep asking myself why I didn't wait another 6 months and (hopefully) allow some of her 2 year old defiance to wither away. Alas, they do these things in their own time and way. Here's to a lower diaper budget and a proud 2 year old boy! You have to know that Sir O is still not -bonafide- potty trained. He still has accidents almost daily and I completely gave up on night-training because it was sucking way too much energy out of me. Something just told me (incessantly) that the Captain was ready to start. So far it looks like that something was right. Maybe it is a first child thing because...oh we are a struggling. Poops are so hard! By the way I think it is so fun...that you have a mini Renn finally! And I am so impressed by your St. patty's festivities! Oh hallelujah!!!!!!! Way to go Captain! p.s. We are in Utah and really want to get together with you! I can't find your e-mail address or I'd e-mail you. Josh lost Renn's ph # or we'd call. Do you have my e-mail address? If you do, do you mind e-mailing me Renn's ph number and I'll have Josh give him a call and get something arranged. That's awesome!! I hope he catches on and holds! I've been wondering about my little guy lately but am still kind of unsure about whether or not he's really ready or I'm just looking for signs. Wow. Can Abby come hang out with him? I'm done with our diaper budget too (and I only have one in a diaper). Hope you survive being housebound for a while (that is the biggest sacrifice for me). You're amazing, always so in tune.